For all clients with systems that rely on well water supplies, who are concerned about wellhead security, Precision is able to provide piece of mind by supplying and installing our unique Wellhead Security Kiosk. This system involves pouring a concrete pad around that part of the well casing or pitless adapter that sticks up above the ground. A 10ga. 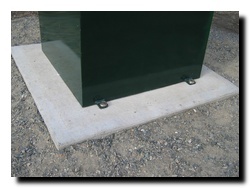 steel kiosk is mounted and secured to the pad by special anchor bolts that can only be removed by authorized personel. 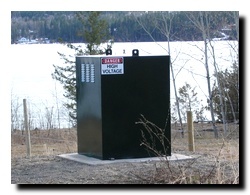 This kiosk encloses the wellhead and prohibits unauthorized access to the well. 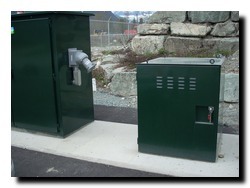 An optional feature is the addition of a limit switch hidden inside the kiosk. The limit switch can be connected to an auto dialer or existing security system. In the event that the kiosk is moved by unauthorized personel, the switch is tripped, and the auto dialer or security system notifies the appropriate authorities. Well-Head security comes in a number of forms from the 5-sided recessed bolts, the the various sizes and shapes of the kiosks that encase the sensitive equipment so that weather and would be vandals do not have direct access to the equipment. 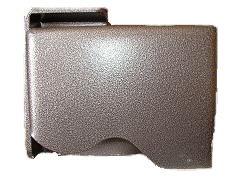 Other aspects of security include devices that protect the direct entry lock system on the kiosks itself or in the case of Sea-Cans or entrances to FRP Lift Stations, the placement of "Lock Boxes" which shields the locking device itself for another layer of additional security. To learn more about Wellhead Security, click the link below.